This outlines the apparent history and apparent influence of what must be described as the quintessential secret society. It also argues rather well that underlying all this type of activity was an urge to preserve aspects of gnostic teachings as surely did the Albigensians as well and the Templars. For all that, secrecy was the hallmark and always in serious opposition with religious orthodoxy. Thus we are describing outbursts of enthusiasm for Gnosticism when all knew full well this was long established heresy. It may never start out that way but it opened the door. In my personal view, the Catholic Church is completely correct to oppose any form of mystery religion whatsoever, if only because any such structure becomes the natural home of any pervert. Any form of perversion can only be mastered and controlled in broad daylight. Thus religion and secrecy must never be combined. Mystery religions also make salvation exclusive which is also a nonstarter. The word “Rosicrucian” is one that most readers will have heard many times. Yet if I were to ask for a definition of the word I would probably be given a wide variety of different answers. I might be told that it was something to do with esoteric Christianity, with alchemy, or with Cabala. All of these things are part of the answer, but not the whole answer. So what is Rosicrucianism? For the time being let us call it a current of thought and ideas which has been flowing through history for at least three and a half centuries and probably quite a bit longer, sometimes underground, sometimes coming to the surface, but always pushing human beings towards certain goals. I say that we can trace the current back three and a half centuries because that was when it first came to the surface. So let us go back to that moment in history. The opening scene is Germany at the beginning of the 17th century. The Reformation had taken place just over a hundred years earlier. Now part of Germany was Protestant, part was still Catholic. The two sides had not yet reached any proper modus vivendi, and the tension between them was soon to erupt into the Thirty Years War, which was to prove one of the most disastrous wars in European history. So there was an expectation of coming calamity. And there was a feeling that European civilisation in general had somehow gone wrong. Now it was at this time that strange things began to happen in a certain part of Germany. We now focus on the town of Kassel. It was here, in 1614 and 1615, that there appeared two mysterious manifestos of unknown authorship. The first was in German, but its title was a mixture of German and Latin. It was called Fama Fraternitatis dess Löblichen Ordens des Rosenkreutzes, which means: The Fame (or Proclamation) of the Praiseworthy Order of the Rosy Cross. The second was called the Confession Fraternitatis, the Confession of the Fraternity. At Damcar Rosenkreutz learned Arabic and received scientific and occult teaching and came into contact with a mysterious book, referred to simply as “the Book M”, which he translated into Latin. “At Fez he did get acquaintance with those which are commonly called the Elementary Inhabitants, who revealed to him many of their secrets…” (Possibly what is meant by Elementary Inhabitants are the “Elemental Spirits” of magic). After two years at Fez he went to Spain hoping to impart his new-found knowledge but met only with hostility and mockery. And this experience was evidently repeated in other countries. So he returned to Germany and eventually gathered about him a small group of men who shared his ideals, and this was the beginning of the Fraternity of the Rosy Cross. The Fraternity had, as its headquarters, a building called the House of the Holy Spirit. The brothers dedicated themselves to studying and spreading the ancient wisdom and also travelled around doing good work such as healing the sick. One of them, it is said, went to England where he cured the young Earl of Norfolk of leprosy. Christian Rosenkreutz himself lived for 106 years, dying in 1484. After his death the brotherhood was continued by his successors. Then in 1604 the brethren were carrying out some rebuilding in their headquarters when they came across a hidden door on which was written in Latin: “after 120 years I shall open.” Behind the door they found a seven-sided vault illuminated by an artificial Sun placed in the middle of the ceiling. The floor, walls and ceiling of the vault were covered in symbolic figures, and there were also chests containing books and ritual objects. In the middle of the vault was an altar, and beneath the altar was a coffin containing the perfectly preserved body of Christian Rosenkreutz. This description of the vault was to capture many people’s imaginations. Two and a half centuries later the English occult society, the Golden Dawn, actually made a vault corresponding to the description in the Fama. One of the key rituals of the order, the Adeptus Minor initiation ritual, was a re-enactment of the discovery of Rosenkreutz’ body. The discovery of the vault was taken by the brethren as a sign that the time was ripe for the society to declare its existence publicly and to invite people of learning and goodwill to participate in the society’s aims and ideals. What were those aims and ideals? We don’t get a very clear idea from the manifestos, but it appears that the brethren believed in a system of universal knowledge incorporating theology, philosophy, mathematics, astrology, and so on. They were firm believers in Christ and the Scriptures. Furthermore, they claimed to have access to an ancient and secret body of wisdom which enabled them to interpret the scriptures correctly. What they appear to be referring to here is Cabala, which is, among other things, a means of decoding the Bible. They talk about being able to understand certain characters and letters which form the basis of all creation. Again, this seems to refer to the cabalistic notion that the universe is actually made up of the letters of the Hebrew alphabet in different combinations. Their beliefs can perhaps best be summed up in the word Gnosticism. By Gnosticism I mean the ancient belief that man’s spirit is imprisoned in matter by a mischievous creator. Man is, as it were, living underwater, not realising that up above is light and air and that if only he could swim to the surface he could get back to his true element. In the Gnostic view this predicament is not entirely hopeless because there are some people who possess Gnosis, that is, knowledge or wisdom which enables them to swim up and to teach this to others. (This Gnosis, this lifebelt of wisdom, is very often represented by a female figure. The Greeks called her Sophia.) This is the essence of Gnosticism, and this is, I believe, what lies behind Rosicrucianism. The Rosicrucians also knew about alchemy, in the sense of a dual process, physical and spiritual, in which the spiritual part was the more important. The early Rosicrucians clearly belonged to the Protestant rather than the Catholic camp. (There are some very contemptuous references to the Pope in the manifestos.) But, they felt that all of Christendom was in need of a new impulse. They believed that Europe was on the threshold of a new age in which spiritual, intellectual and political enlightenment and brotherly love would flourish, and they saw their role as being able to help usher in this new age. That essentially was the message of the first two manifestos, but, of course, what is not clear is whether the brotherhood existed at all or whether it was a deliberately created myth. In 1616 appeared a third Rosicrucian document published at Strassbourg, in German, under the title ofDie Chymische Hochzeit Christiani Rosenkreutz (The Chemical Wedding of Christian Rosenkreutz). The title is slightly misleading because it is not about the wedding of Rosenkreutz himself but purports to be an account by him of his experiences as a guest at the wedding of a King and Queen. The wedding takes place in a castle which Rosenkreutz reaches after an arduous journey. The story is full of occult imagery. For example, on the fifth day of the celebrations, the guests are taken to an island in seven ships flying flags bearing the symbols of the planets. On the island an alchemical operation is conducted in a seven-storied tower, in which two homunculi are created from the bodies of six people who have been killed. In the roof of the Tower is a hole through which two souls descend and enter the homunculi. Finally, the company returns to the castle, this time in twelve ships flying flags of the zodiacal signs. The author of this document was a 19-year old man, Johann Valentin Andreae. Andreae was in fact a very important figure. He was a Protestant pastor and theologian, immensely influential in the German Protestant movement – in fact almost a kind of Luther of his day. And the strange thing about him is that in some of his later writings he referred very contemptuously to the Rosicrucian movement. In his autobiography, for example, he called it a “jest” – and this had led some people to say that the Chemical Wedding was in fact an attempt to debunk Rosicrucianism. I don’t believe this myself. I believe Andreae was – at least when he wrote the Chemical Wedding – very deeply involved with the whole Rosicrucian movement. So these three manifestos are the basis of the Rosicrucian movement as we know it. The effect of the three manifestos was astonishing. They stirred up a tremendous controversy in Europe. Many people wrote to the brotherhood hoping to be admitted. If any received replies they remain unrecorded. Other people attacked the brotherhood. Others claimed to be members of it. And in due course many societies were set up imitating the one that is described in the original manifestos – which, as I say, may or may not have existed. So what you ended up with was a core of mystery with huge ramifications, emanating out from these publications. Part of the appeal of the Rosicrucian movement lies in the richness of the Rose Cross symbol. It is possible to interpret this in all sorts of different ways. Both the cross and the rose are very ancient motifs. The cross appears in many religions and mythologies and seems to indicate a universal tendency for man’s inner consciousness to seek fourfold patterns: you have four points of the compass, four seasons, four elements, four worlds in the Cabala, and so on. The cross also suggests masculinity, and – in the Christian tradition – suffering, sacrifice and death. As for the rose, this can also be seen in many different ways. One of the things that the rose stands for is secrecy. The sign over Roman taverns signified that anything said in drunkenness would not be repeated – hence the expression sub rosa, meaning confidential. On another level the rose can be seen as the Western form of the lotus. Now the lotus, in Hindu mythology, represents the female life principle and is the symbol of the yoni or female sexual organs. So we have lotus/rose as female, cross as male. And if we look at ancient Egyptian mythology we find that Osiris, the god of the underworld who died and came to life again, is often shown wearing a crown of lotus flowers. 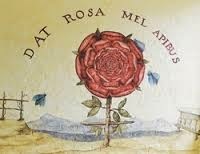 So here we have another possible interpretation: lotus/rose = resurrection, cross = death. In other words, the Rose Cross represents the balance between a series of polarities: death and resurrection, male and female, sacrifice and the reward of sacrifice. It is an elusive symbol, but a very suggestive and powerful one. And it is typical of the great inner wisdom tradition of which Rosicrucianism is part, to use these shorthand emblems which carry deep layers of meaning. Many examples can be found in the emblem books of the 16th, 17th and 18th centuries – for example the famous image of the dolphin curled around an anchor, with the motto festina lente (“hasten slowly”). These emblems serve as a secret code through which those in touch with the inner traditions can communicate their ideas, but they also work at a deeper level than a message which is framed in straightforward words. So did the Rosicrucian plan misfire? I think not, because this is an interesting example of what happens when you plant a mystery in the collective mind of society. It’s like dropping a stone into a pond: the ripples go on and on. And, in this case, the initial impact was so strong that the ripples are still going today. And this, I believe, is exactly what the authors of the manifestos intended. They took the view that if you wanted to bring about a new age, the way to do it was to frame your ideals in the form of a legend, to cloak the legend in mystery and then to launch it in such a way that it was bound to create endless debate and controversy. How successful was this ploy? Did those men who launched the manifestos succeed in bringing about any of the reforms that they desired? You may well say – looking at the state of Western civilisation – that they failed. But before we judge, let’s look a bit more closely at some of the repercussions of the manifestos. Although the Rosicrucian philosophy was presented as a total package of religion, science, etc., it tended to divide into three different streams: first, there was the scientific, philosophical stream; secondly, the social and political stream; thirdly, the Hermetic-Cabalistic-Alchemical stream. There is evidence the first of these two streams gave rise to a number of learned institutions in various parts of Europe, including the Royal Society in England, which of course was, and still is, one of the most important scientific bodies in the world. Many of the inventions and discoveries that have shaped our environment have come out of the Royal Society. I shall not go in detail into the connection between the Rosicrucian movement and the Royal Society, but one link, for example, is through an interesting man called Comenius: a Bohemian refugee, a member of the Andreae circle, interested in Utopian ideas, who envisaged an ideal state in which science and religion would flourish side by side and in which men of all creeds and races would be respected. Comenius came to England in about the 1640’s and he knew the leading scientists of the time. And furthermore, it is clear that scientists such as Robert Boyle and John Wilkins knew all about the Rosicrucian movement. When the Royal Society was founded in 1660 it is very likely that it was in some sense an attempt to realise the scientific and philosophical side of the Rosicrucian ideal. It is also possible that Rosicrucian influences were behind the creation of speculative masonry. So clearly there is at least some connection between Rosicrucianism and the early history of masonry. And in masonry we see really a combination of all three of the streams that I mentioned: the philosophical, the social and the esoteric. Here again there may be a link with Comenius, as he also knew many of the men who were behind the formation of the Grand Lodge of London. Think for a moment of the multifarious ways in which Masonry has influenced the world: its role in promoting the ideas of the Enlightenment, its influence on the French Revolution, the fact that a large proportion of the signatories of the American Declaration of Independence were Masons, the way in which it has impacted on literature, art, architecture and music, the famous figures who have been Freemasons, from Voltaire to Goethe and from Mozart to Churchill. It can be argued that all of this is indirectly part of the Rosicrucian heritage. Let me give you another example of the influence of Rosicrucianism in history. I mentioned earlier that many societies and fraternities have adopted the Rosicrucian label. One of the most important was a German fringe masonic group called the Order of the Golden and Rosy Cross. This Golden and Rosy Cross was a remarkable phenomenon. It was a kind of Golden Dawn of its day, bringing together many different elements and fusing them together in the same sort of way that the Golden Dawn did. In fact the Golden Dawn adopted the grade system used by the Golden and Rosy Cross. That passage is pure Gnosticism, and it confirms what I was saying earlier about the Gnostic character of the whole Rosicrucian movement. The Golden and Rosy Cross was founded in about 1757, and it soon had lodges all over the German-speaking world. There was, for example, a very active lodge in the duchy of Sulzbach. And it is no coincidence that Sulzbach at the time was a tremendous centre of Hermetic and Cabalistic studies. There was even a Hebrew press there. But the real heyday of the order came when one of its members became King of Prussia in 1786. This was King Frederick William II, successor to Frederick the Great. During his reign the court and government were dominated by a Rosicrucian clique led by the King’s two Rosicrucian mentors, Wöllner and Bischoffswerder. Wöllner was something of a fanatic, and there is a story that on one occasion he wrote to a fellow member of the order telling him to stop doubting that adepts of the 8th degree had the ability to hatch chickens out of hard-boiled eggs. Under Frederick William II Prussia became for a time virtually a Rosicrucian state. Unfortunately it all collapsed because Wöllner and Bischoffswerder pursued thoroughly reactionary policies, made themselves very unpopular, and were eventually turfed out when the King died and his son came to the throne. So the Rosicrucians – like any other body of men – sometimes failed. There are many other examples I could give you of the practical influence of Rosicrucianism. I could point to the mystical community of German settlers in Pennsylvania that was influenced by Rosicrucian ideas. I could point to the Golden Dawn and the enormous ramifications which that has had. I could point to the vast amount of literature, art, even music, inspired by Rosicrucianism. So it begins to look as though those early Rosicrucians did achieve something after all. When we look at something like Rosicrucianism, or at the Templars or at Freemasonry or at the legends of the Holy Grail, we are looking at the tip of an iceberg. I believe that behind these phenomena lies a very ancient current. What precise form it takes I know not, but I believe that every so often in human history this current comes to the surface. It can emerge in the obvious form of an esoteric movement. It can also come out in more subtle ways. It can come out in the arts or in science; in architecture, in garden design, in craftwork, in typography. But one usually recognises it when one sees it because it has a certain stamp of yearning for eternal beauty and truth. And at this point I should like to mention a piece of fiction that struck me as being a remarkable allegory of the Rosicrucian movement. It comes in a short story by Jorge Luis Borges called Tlön, Uqbar, Orbis Tertius. The essence of the story is this: you are asked to imagine a group of people who come together and decide that they will invent a fictitious country. They then decide that they cannot invent a country in isolation so they must invent an entire planet. And this is what they do. Furthermore they produce an encyclopedia of 40 volumes all about this planet, which they call Tlön. The encyclopedia contains minutely detailed descriptions of every aspect of this imaginary world: its geography, history, folklore, its religions, its languages and their grammar, its literature, and so on. Then they surreptitiously leak out clues about the imaginary world – at first just little things such as religious objects. Then they plant a copy of the encyclopedia in a library, and gradually this mysterious world starts to capture people’s imaginations to such an extent that the real world starts to imitate it. And towards the end of the story Borges writes: “A scattered dynasty of solitary men has changed the face of the world. Their task continues.” That could equally well describe the men who launched the Rosicrucian movement. In conclusion let me address the question: what is the relevance of all this to us today? In the first place, it is possible to draw certain parallels between the age of the Rosicrucian manifestos and the present day. There was the same feeling then, as there is today, that the world was in chaos and needed a change of direction. And there was the same expectation of a coming New Age. The Rosicrucians linked it with certain astrological indications. Likewise we link it with the Age of Aquarius. The Rosicrucian vision of the New Age is one that makes a lot of sense today. I mentioned the Rosicrucian emphasis on universality. One aspect of this is the need to draw together religion and science, so that the scientist always works in a spirit of service to God, as the alchemists did. Today we are seeing a renewed striving to reconcile science and spirituality. Furthermore this holistic vision has begun to embrace not just religion and science but many other areas of our culture including art, architecture, technology, politics and ecology. I think perhaps the most important thing about the relevance of the Rosicrucian path for us today is that it involves not only personal enlightenment but also service in the widest sense. We are talking about a complete vision, a dream of what humankind and the world could be like. If you want to have a dream, the Rosicrucian one is still alive. The above article is reprinted with permission from The Inner West: An Introduction to the Hidden Wisdom of the West, edited by Jay Kinney (published by Jeremy Tarcher/Penguin USA). It originally appeared in Gnosis 6 (winter 1987-88) under the title “The Rosicrucian Dream”. 2. J.J. Bode, Starke Erweise (Leipzig: Goschen, 1788), p. 25.